Have you ever wondered if Richard Osterlind has a favorite pendulum routine? He does...and for the first time ever, he shares his private routine with you. 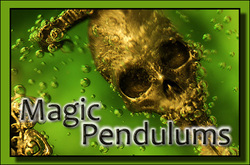 Richard also includes a list of invaluable tips for pendulum use. It's all in the book to the left. It's a new ebook...but not just a book of routines from some of the biggest names in mentalism and magic today. (Osterlind, Nadata, Tahoe, Prater and Jaramillo.) It's much more than that. 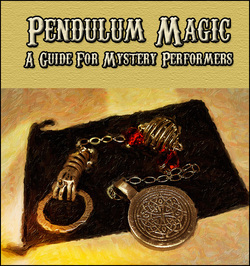 We wanted a book that would be a true reference for working pros as well as performers who are brand new to using pendulums...a book that would lay out the basics from working pros who are actually using them in their day to day performances. This isn't pie in the sky theory. You'll get hard and fast tips that come from successful performers who are using pendulums in the real world in front of real audiences. The book is designed to be a different KIND of reference: it's been written to stimulate YOUR creativity. Each of the routines, each of the tips from the pros, is designed to be tailored to suit your performance style and revolutionize the way you perform with these amazing props. It's done, edited -- and ready for sale on September 1st. On September first, we are offering this book for $19.95 At midnight it will begin selling at its regular price of $24.95. Expect to be delighted on September 1st. That's when we'll unveil our full line of Magic Pendulum Designs. You'll see categories built on fantasy creatures and things (and people) that go bump in the night. You'll see bright splashes of pendulum color and understated Victorian masterpieces. We're going to have a forum where you can share your thoughts and ideas about how to use pendulums in your performances...and ask questions of pros who use them all the time. Our idea is to make this a one-stop resource for entertainers who use pendulums. You are also going to see SPECIALS of the week as a constant feature here. Since many of the designs are one and two of a kind, we expect these to change very rapidly. As our designs sell out, we will never repeat them again. Please take a second to let us know what you think with our Spiffy Two Question Poll so we better understand what you'd like to see here. During our first week of full operation, you may expect to see madness in pricing. Some of our pendulums will be marked down 50% off their standard pricing. Why is this significant? Because many of our pendulums use pewter and very fine crystal. There are going to be some fabulous buys.